my Birding Sarawak: An unidentified 'eagle'. 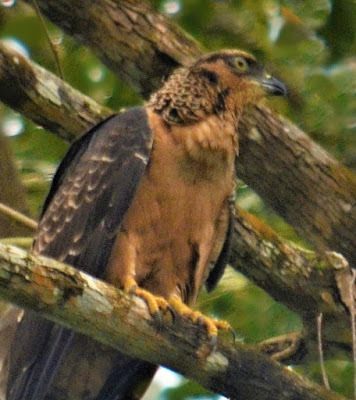 Today - 15 January, 2018 I was very lucky to have spotted this 'eagle' at Kuching somewhere near the Astana Gardens and the Orchid Park. I saw a pair but the other mate was a bit too far to shoot but I guess that doesn't matter. Most important I have a record of encountering this beautiful bird. It was repeatedly making calls to its mate and when it flew closer to it, it perched on a nearby branch close enough for a good shot. On returning home I checked many books on its identity and couldn't get any resemblance. So I guess this 'eagle' remains unidentified.